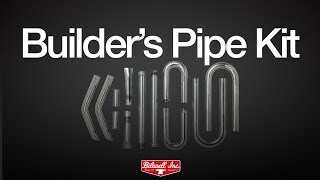 The Motorcycle Builder Exhaust Pipe Kit from Biltwell is one of their original products, and it has stuck around for a reason. If you are building a custom exhaust for your motorcycle you will find everything you need, and more, included in this kit. Whether your ride of choice is a Shovelhead, Ironhead Sportster chopper, Big Twin Evo bar-hopper or a what-in-the-heck-is-that, there is enough here for you to make whatever you'd like. Other things you might find useful are several colors of exhaust header wrap, and if you are building custom exhaust pipes that run high down the side of your bike take a look at our selection of finned, smooth and fish scale aluminum motorcycle exhaust heat shields. These will keep you and your passenger from accidentally burning your leg while riding, plus there is the added benefit of their cool style. NOTE: All tubing measures 1.75" O.D. AND All raw tube sections are pre-polished to make chroming after joint finishing easier. Kit was complete and exactly as advertised. Worked awesome. Great product. Made my first exhaust easy with all the parts and bends i needed. Now to learn how to weld good enough to finish it! Pipe set is very nice quality. Smooth bends and plenty of options with all the different flanges and bends.